Keep your trees growing strong with mulch! Using mulch throughout your landscape will help improve its health and beauty this spring. But what should you do when you have trees on your property? Here are some tips for how to mulch near your trees when they are still growing. First of all, it’s helpful to take note of what you shouldn’t do. For instance, don’t use too much mulch. When you use too much mulch, you can create what is known as a “mulch volcano”, when there are beds around your trees that are filled in with even more mulch. The reason these are so problematic is that they can prevent water from reaching your trees due to the effects of blocked runoff and choked roots. Another issue caused by over-mulching your trees is that it’ll hurt your trees. You might accidentally infect your trees with a disease that will require professional treatment, or attract the notice of wild animals who will damage your trees. Create thin layers of mulch: This thin layer should only be about two or three inches. By doing this, you can discourage weed growth that might steal water from your trees. the mulch will also help shield your tree roots from the heat of the sun as spring turns into summer and the summer rolls on. With the right amount of mulch, you can also prevent problems caused by possible soil erosion. Use shredded leaves: Another technique you can try is to use some shredded leaves along with conventional mulch. You can recycle fallen leaves if you decide to do this, and increase the number of nutrients that will nourish your trees. Keep in mind though that shredded leaves won’t last as long as regular mulch, and at some point, you will need to replace the layers you have placed around your trees. Nelson Tree Specialist provides specialty arborist services, tree crane services, tree care services, and dead tree removal services. We are well known for our top-notch skills and professionalism. We are members of the International Society of Arboriculture and we are considered certified arborists. We are also an accredited business through the Better Business Bureau and we have great reviews on Angie’s List. 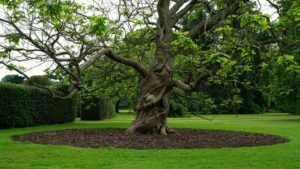 To find out how we can help your trees, whether they are exotic and strange or normal and plan, give us a call at (301) 854-2218 (Washington, D.C.) or (202) 909-5662 (Baltimore) or visit us online. For more interesting tree facts and tips, follow us on social media on Facebook, Twitter, and Google+. This entry was posted on Friday, April 27th, 2018 at 9:39 pm. Both comments and pings are currently closed.